Broken sports and recreational facilities have been spotted at the Tanjung Mas recreational park, here. These irresponsible acts are the work of vandals and are posing danger to children. Lim Yok Choo, a visitor from Sungai Abong, said although the park is clean, the slide and swing set are no longer safe for children to use. “I used to take my children to the playground. Now, I have to stop them from using the facilities due to the dangers posed,” she says. Lim pointed to the slide which has a hole down the middle part. She says the local authorities should repair all damaged amenities immediately to prevent any potential mishaps. She adds that the broken facilities are an eyesore. Another visitor, Izat Aziz, says the Muar Municipal Council (MPM) should put up a signboard to notify park goers about the damages pending repair works. 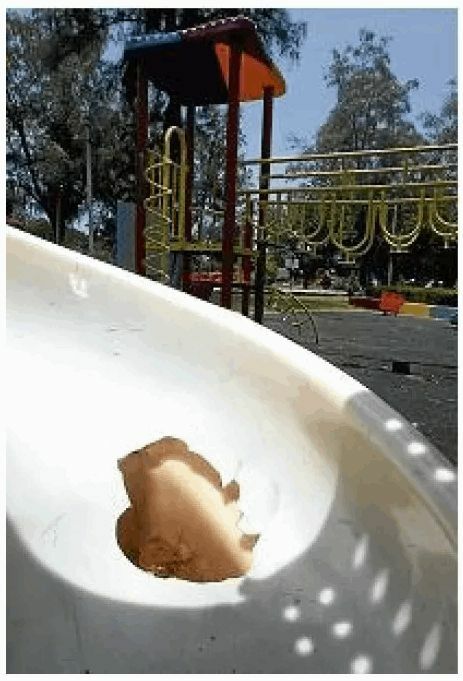 “It is not easy to control the children once they enter the park and rush to enjoy the slide,” he says. Izat hopes that MPM will act fast as the playground is frequented by parents and their children. MPM president Ramli A. Rahman says the council has received a complaint and will look into the matter as soon as possible. Ramli is appealing to the public to be responsible when using public facilities.